The easiest way to celebrate during a Sunday church service is to pray for Grandparents. Ask all grandparents to stand, have someone nearby lay hands on them and pray as a congregation for these “golden agents” that the Lord has placed in our families. On the Sunday kids go back to school, put all the names of the people in your church community that are over 60 on cards in a mystery container. Invite children to draw one or two names from the container. Children may make a handmade card, craft or personalized coupon for their “adopted grandparent” and present their gift on Grandparents Day. Encourage the adopted grandparents to pray for this child throughout the school year and check in with them occasionally. Download a bookmark to decorate. 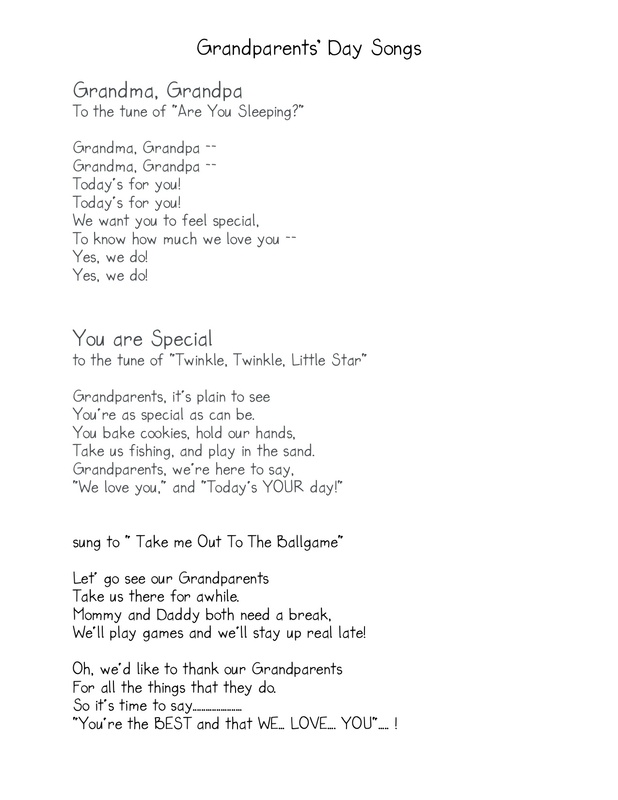 Give a gift to highlight the presence of grandparents in your worship service. A few ideas: a carnation or any flower to pin to a lapel or wrist corsage style, a special “G-Parent” name-tag / button, or bracelet as the grandparents enter the church service. Take your appreciation to a higher level! Include a significant grandparent in the sermon connecting their God-given role to the sermon topic for the day. Invite grandparents to enter their best Casserole creation and appoint celebrity judges (kids, priest, choir master, area mayor or school principal etc.) The grand prize winner is awarded “THE JOY OF COOKING GOLDEN WOODEN SPOON AWARD” (a simple homemade trophy or award made from a painted wooden spoon.) Runner up certificates can include “The Heart Attack” dish most likely to result in heart surgery. “South of the Border Award” for the most spicy dish, “The Grand Kids Special” for the most kid friendly dish or “The Kraft-licious Award” awarded for the cheesiest dish etc. Following the judging everyone enjoys samples of the covered dishes. PS: Lactose Tolerance Required. Have some Lactaid on hand for those that would appreciate it. Have a special dessert contest in “honor” of the grandparents at your coffee hour. Invite folks to make their best pie – savory or sweet. Invite a small panel of grand-kid judges of varying ages to score the pie entries. Use old fashioned blue, red and white ribbons for prizes and give grandparents the honorary “first slice” of each pie. Invite all grandparents to a time of special prayers in the church giving thanks for them. Also, pray for them to pass a legacy of faith to their children and grandchildren. Invite prayer teams to offer prayer for specific relationship concerns. Include a candle lighting experience for worshipers to pass the light of faith with the generations coming after them. Introduce “G@P Groups” to a gathering of small group leaders at a supper hosted in a home. “G@P Groups” are a national organization founded by Lillian Penner of http://www.grandparentingwithapurpose.com. These groups establish an intentional time of prayer where grandparents gather regularly (weekly or monthly) to pray diligently for their families. Not only do these groups cover loved ones with prayer but also “G@P groups” are excellent ways to promote regular community and fellowship vital to energizing this generation in their Godly roles. Cathy, this is great. Great ideas. Bless you! I will share this on my Facebook, if you don’t mind.